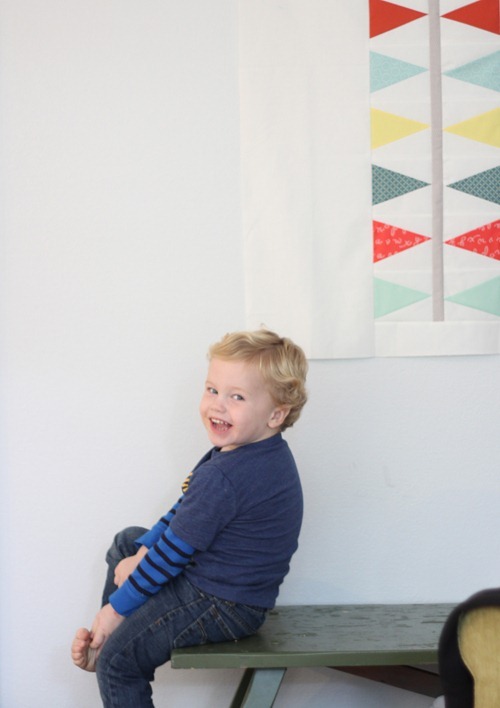 This is one of those no-reason quilts, but after seeing this print I just had to try making a kite tail quilt. It took some trial and error…and I’m still pretending like those points are all matched up (they’re not). It’s been hanging on the wall while I decide what to do with it. 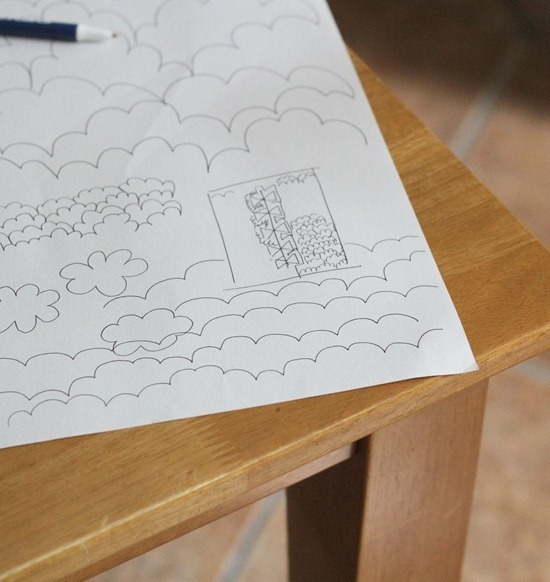 I want to quilt “clouds” in the white space…but it’ll take some work to get my clouds just right. On paper they either look like flowers or scallops. Should be an adventure! The winner of Natalia’s book is “Mom2Caleigh”. I emailed you!! My blog has been a little wonky lately…if you can’t see this post – especially on a mobile device – I’m working on it, sorry! I LOVE it!!! Try this, when making your clouds in circular shapes, do a big scallop, then a little one, then a big one, then little, until you get all the way around to where your started. It will help take away from the flower shape. Can't wait to see it finished!!! It's adorable and it would be great in the boys' room. Good luck on the clouds. I love it! So what if the points don't match up. I'm learning (mostly by others telling me) that homemade quilts don't have to be perfect—that's what makes them so charming. Cute! I really liked the "happy cloud" quilting Katie (Sew Katie Did) used on a charm quilt she recently blogged about; I wonder if that would work for you? That is a lovely design, the clouds will be fabo ! Cool! I just picked up Bizzy Kid and PowWow at my LQS yesterday. Can't wait to make them! 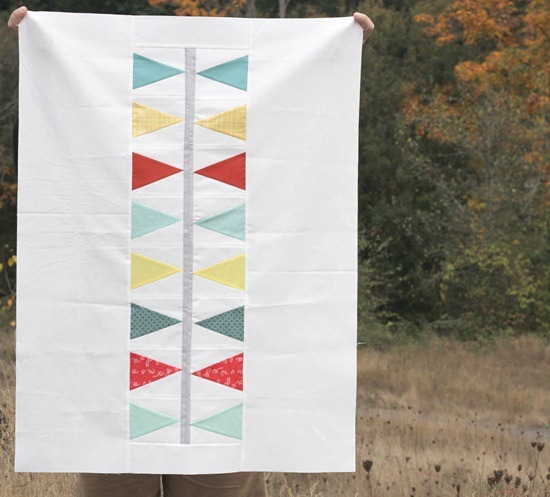 I agree, a quilt should show the hand of the maker and doesn't have to be perfect. Why don't you quilt it with kite shapes linked by the kite tail. I love how clean and fresh that quilt feels! I found this print in the beginning of this year and planned to make it as a mini quilt but I could never get it quite right. Yours looks great! It looks fabulous and cloud quilting will be so perfect!! I love your clouds. I think they look like clouds. Love it! What a great wall hanging for the boys room. Love the pic of your little guy- (he's not so little anymore-:) He's such a cutie!! Have a great day! Honestly, if you hadn't mentioned that you had wanted the points to match I would have thought that the slight off set was intentional. :) I think that adds to the design of kite tails. Love it! I can see it hanging on a wall with the kite part affixed to the ceiling! Or turn the tail sections around with points pointed out and it becomes sailing (as in boats) flags. Love it! Great colour combo. Have you tried practicing your quilting on a marker board? I love it! I think your idea of quilting clouds would be a great idea that would finish off the quilt. what kind of binding would you use? Maybe if you made the clouds bigger? Anyway, relax & have fun with it!! What a great design. Takes me back to the days when actually MADE kite tails! I'd forgotten about that. Big smile. 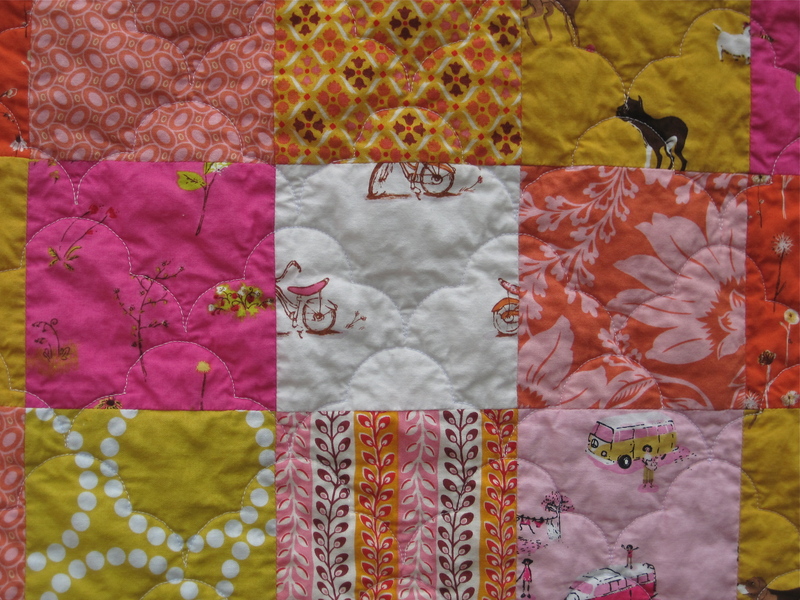 What an adorable quilt- love it! I am in love with this quilt! Any plans for a "how-to?" Love Love Love it! Awesome!! 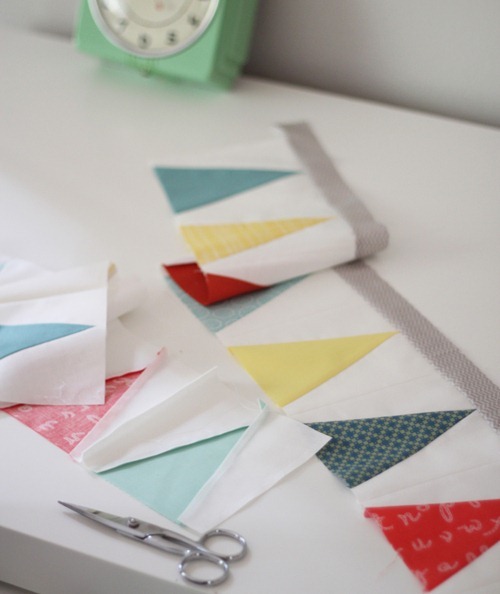 So simple and yet so beautiful… makes me want to run home and sew! So cute!! If I might make a suggestion: you might try making the bottom of your clouds straight instead of taking the scallop all the way around. Can't wait to see this finished. Check out this as an idea for cloud shaped quilting…. I think it might look great on this quilt! This is such a lovely fresh quilt, I love it! I am going to have a good lurk around your other quilts too, all look so yummy, original and modern. Thanks for sharing your beautiful work with me!